My IG is 13 yrs. young and loves chicken! I switched her over to Freshpet about 2 years ago and haven’t looked back. I just noticed the new version of the mini nugget in the Whole Foods in Friendship Heights, DC store and hope its carried throughout all Whole Foods in the metro DC area. I’ve noticed the other Fresphpet options at the Unleashed by Petco and other pet stores but this is the only variety of Freshpet she goes for. She absolutely loves it and usually comes back to her bowl looking for more. I like it since I no longer have to cut up the log version, just scoop and go. 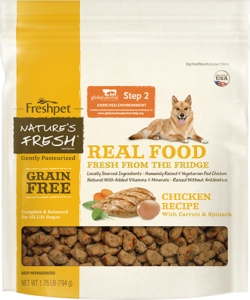 So yes, I’m a big fan of this Freshpet brand and would recommended to any pet owner.